always been right about the character of Judge Pyncheon. He was a man to be feared. If he once decided upon a certain course of action, he would use any and every low means to get what he wanted. What would happen to the gentle, sensitive Clifford when faced by such a man? For a moment the thought came to her that perhaps Clifford did know where Uncle Jaf-frey had kept his money and important papers. She remem-bered, though not very clearly, that Clifford had often talked when a young man of having a great deal of money one day. He planned to travel in Europe and perhaps study there. But these were only dreams of his. It was impossible that he held the secret of the lost money and papers. Could no one help her now? Hepzibah thought of Holgrave, the photographer. She passed quickly dovvn several long halis to Holgrave’s room—but he was not there. Now there was no-thing else to do. Judge Pyncheon would soon cali up to her from downstairs. She went to Clifford’s room. She knocked on the door, but there was no ansvver. She knocked again—but Clifford stili did not answer. Then she knocked a third time— loudly. There was nothing but silence. She opened the door and went into the room. Clifford was not there. Where could he be? Hepzibah was very much frightened. How could Clifford have gone out without her knowing it? She.ran to a window and looked dovvn into the garden, thinking he might be there. But he was not in the garden. She opened the door of the sitting room. The room inside was dark as usual. She could see the judge stili sitting there, looking at his watch. She was about to enter the living room when, at this moment, Clifford himself came toward her from inside the room. He stood before her in the doonvay. He was pale—almost deadly white. There was a curious expression on his face. He pointed tovvard Judge Pyncheon as though he wished Hepzibah and ali the world to look. Hepzibah was both surprised and frightened at the same time. She couldn’t understand Judge Pyncheon’s silence except to think that he was watching Clifford and think-ing to himself that here was more proof that Clifford was not in his right mind. With these words, Clifford began to laugh. Hepzibah pushed him lightly to one side and disappeared into the room. But she retumed almost at once, with a deep cry in her throat. “My God! What is to become of us?” she said. Hepzibah saw that Clifford was dressed, ready to go out, al-though he had never once left the house before. He also seemed to expect her to go with him. Ali of this seemed like some strange dream to her. She was very nervous, and her whole body began to shake. Any action at ali, therefore, was welcome to her at this point. Hepzibah did as she was told. She began to wonder, it is true, why she did not wake up. Of course, ali of this was not real—no such black day as this had yet begun. Judge Pyncheon had not talked with her. Clifford had not laughed pointed to Judge Pyncheon, told her to go with him. But the moment of vvaking did not come. It did not come even when, just before they left, Clifford went once more to the living room door, looked in, and bowed politely toward Judge Pyncheon. A. 1. Why was Hepzibah very nervous? 2. Why did she think that Judge Pyncheon was a man to be feared? 3. Why did she think for a moment that perhaps Clifford did know where Uncle Jaffrey had kept his money and im- portant papers? 4. Who did she think might be able to help her? Where was he? 5. How many times did she knock on Clifford’s door? 6. Why was there no answer? 7. Where did she think at first that he might have gone? Was he there? 8. Why did she think he would make a strange figüre on the Street? 9. Who did she finally turn to for help? 10. Who was in the sitting room besides the Judge? 11. Why was Hepzibah frightened? 12. What did Clifford say to her? 13. How was Clifford dressed? What did he seem to expect of Hepzibah? 14. Why was any action at ali vvelcome to her? 15. What did Clifford teli her to do? 16. What did Clifford do just before they left? Although it was summer, the east wind was very cold as Hepzibah and Clifford faced it on their way up Pyncheon Street and towaıxis the çenter of town. Yet it was not so much the wind that caused Hepzibah to shake with cold as the hap- penings of the past hour. It seemed to her that she and Clifford were just like two small children leaving the House of the Seven Gables for the first time and entering the cold world outside. As they walked on, Hepzibah looked at Clifford from time to time. He seemed to be a completely different person. He was, of course, very much excited. Possibly for this reason he seemed stronger and more decided in manner. Since the weather was very bad, there were very few people on the Street. If it had been a more cheerful day, they could not have gone through the streets in this way without attracting attention. They were both dressed very strangely. Their clothes were not only old and worn but of a style no longer in use. Hepzibah felt this and tried to draw more deeply into herself. Nothing seemed real. Hepzibah kept saying över and över to herself, “Am I awake? Am I awake?” But she continued along at Clifford’s side. Whether it was his plan or not, she did not know; but soon they arrived at the town railroad station. Without saying anything to her, Clifford led her to a waiting train. He then helped her to get on. Soon there was the loud noise of the train starting. In another minute the train was mov- ing and they were leaving the station. To Hepzibah it seemed that she had been picked up and thrown suddenly into the everyday experiences of a new and different world. Looking out the window, they saw this new world move past them. First, they saw many small farms. Then a town appeared with its houses and small country church. In another moment ali this had disappeared again. Ali was new to Clifford and Hepzibah. Within the train itself there was the usual life of those who are traveling. The simple fact that there were fifty other people so close to them was in itself a nevv and strange experience. A conductor came through the train and asked them for their tickets. Clifford gave him money. “I do not agree with you,” said Clifford quickly. He seemed ready to talk with anyone at ali. He explained to the man that he much preferred to be on a train, for example, than at home. The train could carry him far from where he lived. Houses, he went on to say, often have a bad influence över those who live in them. Families live generation af ter generation in the same house. The houses become like prisons, cold and ugly. It is much better to live freely—to come and go as one wishes. As he talked, Clifford grew more and more excited. His face and his eyes lit up. Other people in the train began to listen to him. a little sadly and said: “Let us come to rest, as the birds do, in this place. 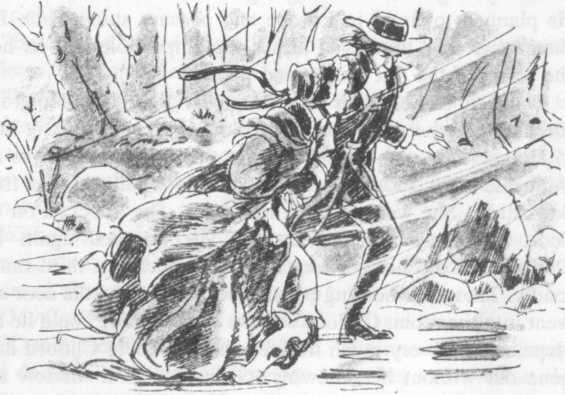 Later we can decide where we shall go next.” Clifford and Hepzibah got off the train and stood outside the station. It was a very small country town. Not far away, there was a small çhurch. The church was very old; the win-dows were ali broken. There was also a house near the church, almost as old and black as the church itself. No one seemed to live there. The rain fell around them. The wind blew—cold and unfriendly. Clifford began to shake with the cold. He was no longer excited as before. His spirits had fallen. He seemed, once again, old and weak. Hepzibah looked up at the sky towards the heavens. The clouds were dark and heavy. She began to pray. A. 1. What caused Hepzibah to shake with cold? 2. What did she and Clifford seem to be like? 3. How did Clifford seem to her to be different? 4. Why should they have attracted attention on some other • day? Why didn’t they on this day? 5. Where did Clifford lead her? What did they get on? 6. Why did Hepzibah feel that she was in a new and different world? 7. What did Clifford teli her to put to one side? 8. Where did Clifford teli the conductor that they were going? 9. What else did Clifford say to a man who sat near them? 10. What was Hepzibah afraid that people would think? 11. What did Clifford ansvver when she tried to make him be quiet? 12. What happened to Clifford after half an hour? 13. Where did they get off the train? 14. What was not far away from the station? 15. How was the weather? What did it make Clifford do? 16. What did Hepzibah begin to do?